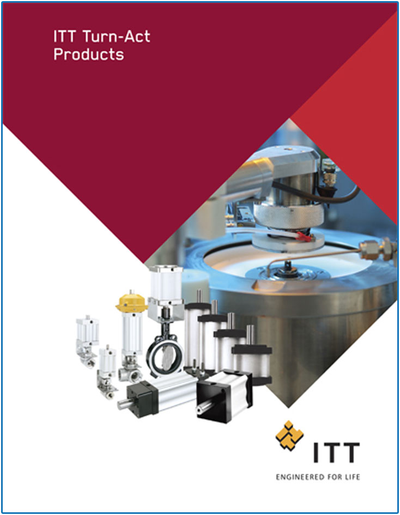 Turn-Act Inc. is a leading manufacturer of pneumatic cylinders, valve actuators, and custom automation solutions. They can assist you with application specifications and support. Turn-Act is dedicated to producing quality products. We have over 3 billion standard products available such as pneumatic cylinders, valve actuators, and custom automation solutions with a large percentage of our sales being application specific specials developed to meet the most demanding needs. Features: 16 base models with torque outputs from 87 in.lbs to 1000 in.lbs and rotations of 45, 90, 180 & 270 degrees. One Moving Part Provides: Zero Backlash, no loss of motion, precise repeatability, continuous full torque throughout the rotation. Patented Urethane seals: Long cycle life and non-lube service. ITT Turn-Act Inc is a custom cylinder manufacturer that delivers more than 60% of its finished products in custom and special configurations. Custom cylinders are available with rapid lead-time from concept to final product. They can take your custom cylinder design and create an innovative, cost effective solution for you. As a custom cylinder supplier, ITT Turn-Act leads the industry with custom pneumatic and custom hydraulic cylinders. Turn-Act employs a staff of design and production engineers with many years of custom product design-build experience to assist you. 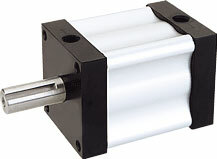 ITT air springs are air-tight and sturdy pneumatic actuators for demanding industrial applications. Air springs are highly durable, precisely engineered and cost-effective for use in a wide variety of actuation and vibration isolation applications. With time-tested designs, fabric-reinforced Neoprene or Natural Robber flex member construction and corrosion-protected end retainers, air springs provide superior quality and performance. As an actuator, air springs provide linear or angular motion. These air springs offer a favorable stroke-to-compressed-height ratio when compared to air cylinders, and can accept a wide variety of actuation media such as air, water, nitrogen or anti-freeze. As an isolator, air springs are effective in reducing the harmful effects of vibration. They can simultaneously isolate vibration and regulate load height, as well as allow for consistent vibration under varying loads. 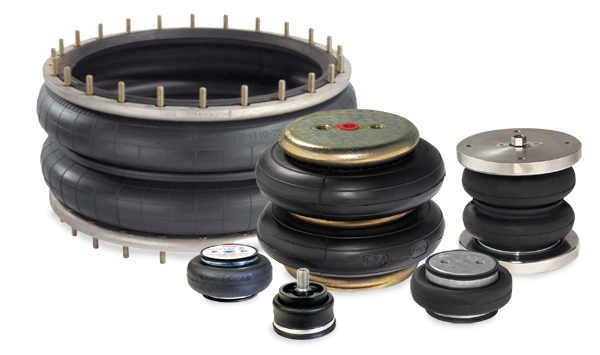 ITT offers a variety of air spring types to meet your actuation or isolation needs. The Single, Double and Triple Convolute Bellows, Rolling Lobe and Sleeve Types are available in a wide range of sizes, with the End Retainer Style Required for your installation. In addition to actuation, many of our air springs can also be utilized as isolators with load bearing capacities ranging from 0.5 kN (112 lbs.) to over 350 kN (78 kip), A number of unique product features make air springs an ideal solution for many different challenging vibration isolation isolation applications. Our Air Springs are pressurized to maintain a set height, regardless of the load. There is no static spring deflection as with other spring elements. A user friendly, automatic control system guarantees a constant operating height even under varying loads. Depending on the type of air spring used, their lateral stiffness can reach up to a 100% of the vertical stiffness. Air Springs enable a very low resonant frequency from approximately 1 Hz to 4 Hz. Here, the resonant frequency is virtually independent of the load-bearing capacity. The excellent insulating effect remains virtually constant even under changing loads. Our air springs offer a compact component height. There is no static spring deflection. Interested in an ITT Turn-Act Product? Find all of ITT's videos on their YouTube Channel.